On 4 November 2007, at midnight, a landslide along the Grijalva river buried a settlement (Juan de Grijalva, Municipio de Ostuacán, Chiapas) located ~ 25 km WSW from the 1982 crater. The event, the subject of a report in the newspaper La Jornada, was reported to have buried 40-60 dwellings and killed at least 10, but more likely 200-300 residents. Concern arose as to whether the event was triggered by El Chichón volcano. The scientists authoring this report, which included those from the Instituto de Geofísica of the Universidad Nacional Autónoma de México (UNAM), noted that low-frequency rumbling (presumably tremor) can clearly be felt inside the active crater. They associated these perturbations with the hydrothermal system. The authors considered the perturbations too small to cause the distant landslide. According to the authors, the landslide at the Grijalva river was probably the result of morphological instability after heavy rainfall, rather than associated with El Chichón behavior. However, in the aftermath of the 1982 eruption, El Chichón's nearby flanks still contain abundant unstable slopes, and the new vegetation fails to keep up with the erosion rate. Also, intracrater avalanches still occur, particularly after heavy rainfall. According to co-author Dmitri Rouwet, the rumbling beneath the crater often triggers small intracrater avalanches. El Chichón was the scene of large Plinian eruptions in 1982, and the crater hosts a shallow crater lake that has drastically varied in size since January 2001. Figure 8 shows the lake in 2005, the smallest volume at this crater lake yet observed. In March 2007 (figure 9) the lake contained the largest volume yet observed (~ 6 x 105 m3). Figure 8. The crater lake at El Chichón when it contained the smallest water volume ever recorded here (5 June 2005). The crater diameter is ~ 1 km. Courtesy of L. Rosales. Figure 9. The crater lake at El Chichón when it contained the largest water volume ever recorded here (26 March 2007). Courtesy M. Jutzeler. Boiling springs.The changes in lake volume stem largely from variable discharges at a boiling spring, rather than merely reflecting direct input from rainfall and evaporation. During 2001, 2004 and 2007 a large-volume lake was associated with a high discharge (over 10 kg/s) into the lake. Saline, near-neutral pH water pours from a boiling geyser-like spring on the lake's N coast. This took place in months such as January, only a few months after the end of the June-October rainy season. The salinity was greater when the lake had higher volume. This observation implies that the direct input of rainwater is not a major contributor to lake volume. Instead, rainwater is thought to infiltrate into the crater floor and then discharge into the lake through the boiling springs. These springs alternate between periods of high- and low-water discharge feeding the lake. The periods of high discharge at the springs correspond to periods when the lake grows. The periods of low discharge at the springs correspond to vapor discharge there, intervals when the lake shrinks. In general, ongoing measurements suggest decreasing concentrations for the boiling spring and crater lake waters with time. This suggest an absence of new magmatic input since 1982. After the 2007 rainy season the lake volume decreased, coinciding with a change to pure vapor emission from the geyser-like spring since August 2007 (figure 10). Figure 10. The crater lake at El Chichón crater lake as seen on 20 December 2007. Courtesy A. Mazot. Tremor, gas fluxes, inferences, and ongoing monitoring.The authors of this report inferred that the low-frequency tremor and rumbling beneath the crater floor stemmed from fluid migrations inside the boiling aquifer, sometimes causing small intra-aquifer phreatic explosions. Nevertheless, crater floor inspection during December 2007 found it unbroken (without evidence of rupture or breaching). The crater morphology, notably the distribution of fumarolic fields, has on the whole remained stable since shortly after the 1982 eruptions. The CO2 gas fluxes from the crater lake's surface and floor were recently sampled using a floating accumulation chamber to measure the output. The calculated mean emission rate at the lake's surface in March 2007 was 1,500 g / (m2 ? day), and in December 2007 a preliminary estimate was 860 g / (m2 ? day). A preliminary flux rate from the crater floor in October 2007 was 1,930 g / (m2? day). In addition, infrared camera images proved useful to quantify the thermal output. A good correlation appeared between gas flux and ground temperature. This may offer potential for future monitoring. The authors inferred that future El Chichón volcanism might take the form of intracrater dome growth. Such growth could follow changes in chemistry, temperature and dynamics of the crater lake, the degassing regime, seismicity, geomagnetism, crater morphology, or other unrest such as the onset of phreatic explosions. Such processes can occur very rapidly, as recently shown by the dome growth at Kelud, Indonesia, in November 2007. However, the authors' investigation found no evidence to support current dome growth. Future updates on the activity of El Chichón can be found on the CVL-IAVCEI website (http://www.ulb.ac.be/sciences/cvl/). Information Contacts: Dmitri Rouwet, Istituto Nazionale di Geofisica e Vulcanologia (INGV-Palermo), Sezione di Palermo, Via Ugo La Malfa 153, CAP 90146, Palermo, Italy (URL: http://www.pa.ingv.it/); Agnes Mazot, Loic Peiffer, and Yuri Taran, Instituto de Geofisica, Universidad Nacional Autonoma de Mexico, Ciudad Universitaria, Circuito Exterior s/n, Col. Copilco, Del. Coyoacan, CP 04510, Mexico DF, Mexico (URL: http://www.geofisica.unam.mx/vulcanologia/spanish/personal.html); Nick Varley, Centre of Exchange and Research in Volcanology, Faculty of Science, University of Colima, Av. 25 de Julio ##965, Col. Villas San Sebastián, C.P. 28045 Colima, Colima, México (URL: http://www.ucol.mx/ciiv/nick/personal_en.htm); Martin Jutzeler, Centre for Ore Deposit Research (CODES), University of Tasmania, Australia; Laura Rosales Lagarde, Earth and Environmental Science Department, New Mexico Tech, Socorro, NM, USA; La Jornada (URL: http://www.jornada.unam.mx/). The Global Volcanism Program has no Weekly Reports available for El Chichón. After several weeks of local seismicity, explosions in late March and early April ejected a series of tephra columns, two of which penetrated well into the stratosphere. Officials reported that as many as 100 persons may have been killed by the eruption and associated seismic activity. Tephra falls were very heavy near the volcano, forcing tens of thousands of residents to flee their homes, and causing major damage to crops and livestock. Activity during 28-29 March 1982. The eruption began 28 March at 2332 and NOAA geostationary weather satellite imagery showed that the eruption column was about 100 km in diameter 40 minutes later. Analysis of an infrared image returned at 0300 yielded a cloud top temperature of -75°C, corresponding to an altitude of 16.8 km, ~ 1 km above the tropopause. Surface and vault microbarographs and a KS36000 (SRO-type) seismograph operated by Teledyne Geotech near Dallas, Texas (1,797 km from El Chichón) received 22 minutes of infrasonic signals generated by explosive activity. Nine distinct signals were recorded, including a strong gravity wave, indicating that the eruption column struck the tropopause. Instruments at McMurdo, Antarctica, 11,865 km from El Chichón, recorded about 2 hours of infrasonic signals. Nine intensity peaks were detected, of which five were clearly from the eruption. Vigorous feeding of the plume continued for several hours but had clearly ended by 0600. A dense tephra cloud drifted ENE from the volcano and a much more diffuse plume moved in roughly the opposite direction (figure 1). By 0530 the next morning, satellite images showed the main plume extending from the Yucatán Peninsula, S of Cuba, to Haiti, and remnants of the more diffuse plume over the E Pacific Ocean at about 15°N, and 118-119°W. The U. S. National Weather Service analyzed wind directions and speeds at different altitudes near the volcano, and concluded that the ENE drift of the dense cloud indicated that it was in the upper troposphere, whereas the diffuse plume blown to the WSW was in the middle troposphere at roughly 6-7.5 km altitude. Initially, none of the tephra appeared to be drifting in a direction consistent with the lower stratospheric circulation, but significant aerosol development in the stratosphere is indicated by the lidar measurements described in the next-to-last paragraph of this report. Figure 1. NOAA geostationary weather satellite image returned 29 March at 1000, about 10.5 hours after El Chichón's initial explosion. A dense upper tropospheric eruption cloud drifts ENE, and a more diffuse cloud drifts WSW, probably in the mid-troposphere. Heavy ashfall was reported from towns near the volcano. At Pichucalco, ~20 km NE of the summit, 15 cm of ash was reported, and 5 cm of ash fell at Villahermosa (population 100,000), 70 km NE of the volcano. Residents of Nicapa, a village on the NE flank, took refuge in a church that was toppled by a M 3.5 earthquake, killing 10 people and injuring about 200. Initial estimates of the number of additional deaths varied, ranging as high as 100, and many more were probably killed on the SW flank during this or subsequent eruptions (see 5 paragraphs below). Most of the casualties on the N flank were reportedly caused by fires started by incandescent airfall tephra. Tens of thousands of people fled the area. The heavy ashfall forced the closure of roads and the airports at Villahermosa and Tuxtla Gutiérrez (~ 70 km S of the volcano). Cocoa, coffee, and banana crops were destroyed, and the cattlemen's association requested that animals from a wide area be transported for butchering because ashfall had made grazing impossible. Activity during 30 March-3 April 1982. A second but much smaller explosion was observed on the satellite imagery at about 0900 on 30 March. A thin plume drifted E about 120 km before dissipating. A somewhat larger explosion that was first visible at 1500 produced a cloud that rose into the mid-troposphere and moved about 350 km N. Activity was declining by 1900. Haze was widespread over central México, reducing visibility to about 8 km in México City ( ~ 650 km WNW of the volcano) and to only about 3 km in Tampico (~ 750 km NW of the volcano). A small explosion shortly before 1330 on 31 March produced a plume that reached the upper troposphere and blew to the E but dissipated quickly. A small explosion during the early afternoon of 2 April ejected a mushroom-shaped cloud that rose to ~ 3.5 km altitude in 30 minutes. Satellite images showed renewed explosive activity early 3 April. An eruption column was emerging from the volcano by 0300 and blew to both the NE and SW. A series of gravity waves and acoustic signals from this activity were again recorded by Teledyne Geotech instruments near Dallas, Texas. The calculated start time for this activity was 0250 and signals continued for 14 minutes. As with the initial explosion 28 March, the powerful gravity waves generated by this event indicated that the eruption column struck the tropopause forcefully. Smaller explosions, calculated to have begun at 0312, generated acoustic waves and a single gravity wave that were received near Dallas for 10 minutes. During the next 5 hours, ash drifted over N Guatemala and Belize. At Nicapa, on the NE flank, 7.5 cm of new ash was reported and a haze of SO2 was visible during the day. Explosive activity resumed about 2000. Acoustic data recorded by Teledyne Geotech indicated that explosions probably occurred every 2-3 minutes, generating a few initial gravity waves and a complex series of acoustic waves that continued for 48 minutes. The total acoustic energy of this activity was significantly greater than that produced by the early morning explosions, and the eruption plume was denser and probably rose somewhat higher. It was initially elongate NE-SW and drifted over S México, N Guatemala and Belize. By noon the next day, a faint plume extended to about 25°N, 79°W, almost to Cuba, and lower altitude material, probably at only ~ 1.5 km, was drifting directly northward along the 95°W meridian. Activity during 4 April 1982. A stronger explosion, possibly larger than the initial event on 28 March, first appeared on the NOAA geostationary weather satellite image returned at 0530 on 4 April and was reported by ground observers to have started at 0522. An infrared image 3.5 hours later showed a temperature of -76°C at the top of the eruption cloud, corresponding to an altitude of 16.8 km, identical to the altitude measured from the 28 March plume. Wind speeds near the volcano apparently remained relatively low and most of the cloud remained over S México and N Guatemala more than 24 hours later. In Pichucalco (~ 20 km NE of the summit) incandescent tephra could be seen rising from the volcano and the ash cloud darkened the sky during the morning as though it were night. Felt earthquakes were also reported early 4 April. At Ixtacomitán, 18 km ENE of the summit, there was a heavy fall of tephra no larger than 4 cm in diameter and the army was sent to evacuate 3,000 residents. No casualties were reported. All villages within 15 km of the summit had previously been evacuated and tens of thousands of people had fled their homes. Government officials reported ashfall over an area of 24,000 km2 and crop damage of $55,000,000. A pumice flow deposit from the 4 April eruption extended ~ 5 km NE from the summit, terminating ~ 2 km from Nicapa. At its distal end, the deposit was about 100 m wide and 3 m thick and contained pumice blocks 1 m in diameter. Temperatures measured by a thermocouple at 40 cm depth on 8 April averaged 360°C, and were as high as 402°C. The pumice flow deposit appeared to have been emplaced as two separate events in rapid succession. Shortly afterward, an ash flow flattened trees in the valley surrounding the pumice flow deposit and left a relatively thin layer of ash that had a temperature of 94°C at 10 cm depth 3 days later. Airfall tephra thickness in Nicapa, 7 km NE of the summit, totaled 25-40 cm [but see 7:4] after the 4 April eruption. Bombs as large as 50-60 cm in diameter had made numerous holes in the roofs of houses and many other roofs had collapsed. In hand specimen, the tephra appeared to be a crystal-rich andesite or dacite containing hornblende and considerable feldspar. In Ostuacán, 12.5 km NW of the summit, tephra was 15-20 cm thick after the 4 April eruption, including pumice as large as 15 cm in diameter. Many roofs had been destroyed. Extreme heat made it impossible to approach the village of Francisco León, 5 km SW of the summit. Midway between Ostuacán and Francisco León, a river was boiling and flattened trees could be seen upslope. Geologists thought it was likely that pyroclastic flows had moved through the area. Of the roughly 1,000 residents of Francisco León, about half had reportedly left before the eruption because of the many felt earthquakes in February and March, but the remainder were missing in early April. A helicopter flight over the village during the first week in April revealed no signs of life. Because of the danger of mudflows when the rainy season begins around the end of April, authorities established a prohibited zone extending outward 10 km from the summit. By 5 April, the low-altitude plume from the second 3 April explosion had reached the S Texas coast and Brownsville reported visibility of only 6.5 km in haze. A few flights into small S Texas airports were cancelled, but winds initially forced most of this material into the Gulf of México. Low-altitude (1.5-2 km) ejecta from the 4 April explosion also moved northward, and a slight change in wind direction blew the ash cloud further N and inland over Texas by late 7 April. A light ashfall occurred in Houston during the night of 7-8 April and samples were collected for analysis by NASA geologists. Activity during 5-11 April 1982. A plume generated by a smaller explosion was observed on satellite imagery at 1130 on 5 April. Ground observers reported that the comparatively minor activity lasted about 3 hours and that no incandescent tephra was ejected. A similar but possibly slightly larger explosion could be seen on the satellite image returned at 0930 on 6 April. Geologists reported that earthquakes as strong as magnitude 1.5 were recorded about every 3 minutes 6 April. Geologists working a few km NE of the summit reported that about 2 mm of wet ash fell at about 1000 on 8 April and 1130 on the 9th. Satellite images returned at 0728 on 9 April and 0238 on 10 April both showed small diffuse plumes, drifitng NNE and SSE respectively. Data from laser radar (lidar) measurements at Mauna Loa Observatory, Hawaii (about 19.5°N, 155.6°W) during the nights of 9-10 and 10-11 April indicated that El Chichón had injected large quantities of volcanic material into the stratosphere. Several layers were detected, with strongest backscattering at an altitude of 25.7 km. Analysis of wind conditions at 25 km altitude in Hawaii and México indicated a likely drift of ~ 5-7 m/s (roughly 430-600 km/day) towards the W, which would carry volcanic debris from El Chichón to Hawaii in 1.5 to 2 weeks. Inspection of a satellite image returned late 11 April showed a moderately dense cloud extending from México to just W of Hawaii, spreading from roughly 300 km wide near the Mexican coast to nearly 850 km near its distal end. No previous eruptions of El Chichón are known in historic time. 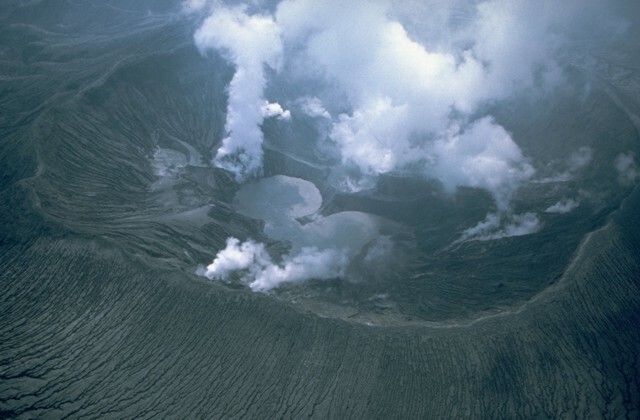 Before the 1982 eruption, the volcano was heavily forested, with a shallow crater, 1,900 X 900 m, elongate NNW-SSE. Solfataras and hot springs were present in the crater and on the flanks. Müllerried (1933) describes voluminous airfall deposits from previous eruptions that he believed to be post-Pleistocene. Reference. Müllerried, F.K.G., 1933, El Chichón, unico volcán en actividad en el sureste de México: Universidad de México, v. 5, no. 27, p. 156-170. Information Contacts: C. Lomnitz, S. de la Cruz-Reyna, F. Medina, UNAM, México; M. Krafft, Cernay; D. Haller, C. Kadin, M. Matson, NOAA/NESS; A. Krueger, NOAA/NWS; F. Mauk, Teledyne Geotech; C. Wilson, Univ. of Alaska; K. Coulson, T. DeFoor, MLO, HI; C. Wood, NASA, Houston; Notimex Radio, México; New York Times; UPI. The 28 March explosion produced heavy tephra falls N of the volcano, but the initial press reports of the thickness of ash deposits, included last month, were exaggerated. A series of three explosions of increasing size occurred 3-4 April, the last of which, at 0522 on 4 April, was the largest of the eruption and produced a major stratospheric cloud. Conflicting reports persist about the fate of the approximately 1,000 residents of a SW flank village that was apparently in the path of one or more pyroclastic flows ejected 28 March or 3-4 April. Infrasonic data. At College, Alaska (6,634 km from the volcano), about an hour of acoustic signals were received from both the 28 March and 4 April explosions. Antipodal acoustic-gravity wave signals from the first 3 April and 4 April explosions were detected at Tennant Creek, Australia (19.52°S, 134.25°E). Volume and composition of tephra. Tephra samples were collected from about 100 sites around El Chichón in mid-April. Near the volcano, three separate layers were evident, ejected by explosions 28 March, 3 April (at 2000), and 4 April. Farther away, only 28 March and 4 April tephra had been deposited. The axis of maximum deposition extended approximately N from the summit for the 28 March tephra and roughly E from the summit for the 4 April material. Both layers were normally-graded but the 3 April layer, where present, consisted only of fine ash. James Luhr calculated that [~0.30] km3 of tephra (converted to a density of 2.6 g/cm3) had fallen within the 0.1 cm isopach (figure 2). X-ray fluorescence analyses of pumice samples showed no significant variation in chemical composition, either within individual units or between units. The pumice, a porphyritic trachyandesite, has a whole-rock silica content of about 57.5%; silica content of the glass is about 61%. Figure 2. Isopach map showing thickness of compacted ash at a density of 1.2 g/cm3, for tephra ejected from El Chichón, 28 March-4 April 1982. Courtesy of James Luhr. Minor activity during April-May. No large explosions have taken place since 4 April, but occasional minor ash emission continued. The active crater, ~ 600 m in diameter in early May, was located within the pre-existing shallow summit crater that had dimensions of ~ 1,900 X 900 m. A 12-km prohibited zone around the summit remained in effect in early May. A four-station seismic monitoring network operated by the UNAM recorded 6-8 small earthquakes per day in early May, including some B-type events. The ejection of a minor ash column on 11 May was accompanied by a few small discrete earthquakes centered at about 2 km depth, and additional seismicity that may have been harmonic tremor. Stratospheric cloud. Careful inspection of visible satellite imagery from the NOAA 6 and 7 polar orbiters, the GOES East and West (U.S.), GMS (Japan), and Meteosat (Europe) geostationary weather satellites has permitted the tracking of the densest portion of the 4 April stratospheric cloud as it circled the globe from E to W. The cloud reached Hawaii by 9 April, Japan by 18 April, the Red Sea by 21 April, and had crossed the Atlantic Ocean by 26 April, dipping S to about 5°N at its W edge. Diffusion into higher latitudes appeared to be very limited. During its first circuit of the globe, the cloud could be seen in part (but usually not all) of the range 5-30°N, sometimes occupying a band roughly 15-20° wide. Tracking of the cloud after late April has been difficult, but careful work may allow the position of the cloud front to be established after that date. Ozone data from the Nimbus-7 polar orbiting satellite, available for the two weeks following the cloud's ejection, allowed its path to be clearly traced, and scientists at NASA's Goddard Space Flight Center hope to continue observations of its position as more satellite data arrives. A balloon flight from Laramie, Wyoming (41.33°N, 105.63°W) in mid-April detected a sharp peak at 17 km (just below the tropopause at 18 km). Lidar stations in the U.S., Japan, and Europe recorded enhanced backscattering in the stratosphare at times that correlated well with satellite observations of the cloud's movement. Very strong signals were detected by stations at lower latitudes, while the cloud appeared to be present only intermittently and near the base of the stratosphere over mid-latitude stations. A possible northward diffusion of the cloud, probably on its second circuit of the globe, is shown by the sharply higher backscattering ratios detected at Fukuoka, Japan (33.65°N, 130.35°E) in May. At lower latitudes, the strongest layers were centered above 25 km. The highest layer detected was at 29.7 km altitude. Persons in the SW U.S. observed phenomena that indicated the presence of stratospheric layers. A Bishop's Ring was first seen from Houston, Texas on 11 April and has been intermittently visible since. The 22° angular distance from the sun indicated a particle size of 0.7-0.9 µm. Unusual sunrises and sunsets have been reported from E Texas since 24 April. From Tucson, Arizona, Aden and Marjorie Meinel observed a primary scattering layer at 13.2 km and a weaker layer at 20 km around sunset on 30 April. By early May, the aerosol cloud had become extremely dense, with most of the material between 14 and 18 km and a trace to 20.5 km. The main body of the layer appeared to pass NW of Tucson during the evening of 7 May. Long windrows of aerosol were visible, similar to the phenomenon seen after the 1976 Augustine eruption. The conspicuous clouds had nearly disappeared by 9 May, but a strong aureole remained around the sun all day 10 May. The high altitude of the cloud made direct sampling difficult and none has been possible in the densest portion above 25 km. Flights from the NASA Ames Research Center near San Francisco to about 23°N on 19 April and 5 May sampled the base of the cloud at about 19 km altitude. Optical depths of the cloud as measured with a sun photometer reached 0.3-0.4, increasing southward. Particles ranging in size from 0.1 to 3 µm were collected. Sulfuric acid droplets were common, but there were very few silicate particles. However, NaCl crystals were a significant component and salt has apparently never before been found in significant quantities in a volcanic cloud. Measurement of the degree of depolarization of layers detected at 15-16.5 km and 24-25.5 km on 22 April by lidar equipment at Nagoya University (about 35°N, 137°E) suggested that particles in the lower layer were strongly non-spherical, while those in the upper layer were mostly spherical droplets. Further Reference. Krueger, A.J., 1983, Sighting of the El Chichón sulfur dioxide clouds with the Nimbus-7 Total Ozone Mapping Spectrometer: Science, v. 220, p. 1377-1379. Information Contacts: F. Medina, UNAM, México; J. Luhr, Univ. of California, Berkeley; M. Matson, D. Haller, C. Kadin, NOAA/NESS; B. Mendonça, NOAA/ERL; K. Coulson, MLO, HI; M. Hirono, Kyushu Univ. ; W. Fuller, NASA Langley Research Center; Y. Iwasaka, Nagoya Univ. ; R. Chuan, Brunswick Corp.; C. Wilson, Univ. of Alaska; D. Christie, Australian National Univ. ; J. Rosen, Univ. of Wyoming; A. Meinel, M. Meinel, Univ. of Arizona; M. Helfert, NOAA, Houston TX; W. Evans, ARPX, Atmospheric Environment Service, Canada. The following summary was prepared by L. Silva, J.J. Cochemé, R. Canul, W. Duffield, and R. Tilling. "Violent eruptions of the stratovolcano El Chichón destroyed its summit dome and formed a 1-km-wide crater. Field studies and eyewitness accounts indicate that the initial activity (28-29 March) was phreatomagmatic, and produced a Plinian column over 15 km high and tephra deposits extending more than 200 km downwind. More vigorous activity 3-4 April produced several pyroclastic flows, some more than 15 m thick, followed by two airfall deposits. Distal sections consist of three airfall layers whereas proximal sections include pyroclastic flows. The total volume of eruptive products is probably less than 0.5 km3, much of which is juvenile pumice, which is highly porphyritic with plagioclase, amphibole, and clinopyroxene as major phenocrysts. Petrographic and chemical data suggest an alkali-rich 'andesitic' composition. The high alkali content of the pumice, occurrence of anhydrite in tephra, and presence of halite in the stratospheric cloud reflect contamination by evaporites. Villages within a 7-km radius were entirely destroyed or heavily damaged. 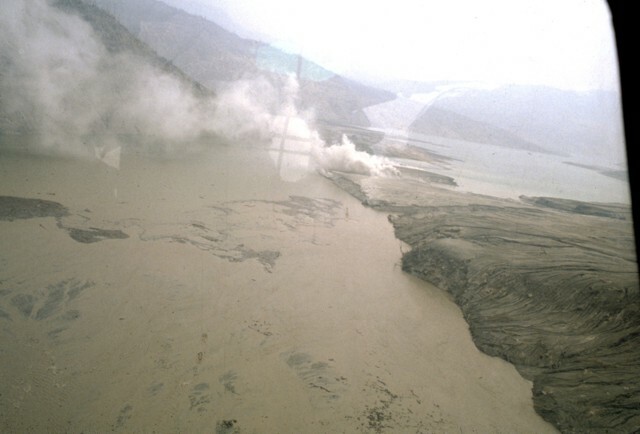 Pyroclastic flows dammed a river and created a 5-km long lake of hot water; the failure of the natural dam on 26 May caused a destructive flood. Study of pre-1982 deposits indicates that El Chichón has developed by several cycles of pyroclastic eruptions, with or without a subsequent growth of domes, with the last pre-1982 pyroclastic eruption about 130 years ago. The current activity may continue and could include dome emplacement." Premonitory seismicity. During field work at El Chichón between December 1980 and February 1981, more than 1 year before the eruption, Rene Canul heard loud noises and felt small earthquakes near the central dome, and could also feel some events while on the flanks of the volcano. People living near the volcano reported felt earthquakes several months before the eruption. March-April explosions. The March and April explosions destroyed most of the former central lava dome and formed a new crater ~ 1 km in diameter and slightly elongate NW-SE. In early June, there were several explosion pits on the floor of the new crater, all of which were filled with boiling water or mud and were emitting vapor. Although heavy rains had compacted the ash, 3-4 m remained at the rim of the new crater. The army reported that 187 deaths were caused directly by the eruption. Among the deaths were one geologist and 32 soldiers sent to the village of Francisco León, ~ 6 km SW of the summit, after the 28-29 March explosion. The pyroclastic flow that traveled through Francisco León left only a thin deposit, but of the structures in the village, only one wall of the church, parallel to the direction of the pyroclastic flow's movement, remained standing. All of the volcano's major drainages contained pyroclastic flow deposits, which were more than 15 m thick in some of the deeper valleys. These deposits were still hot in late May and were occasionally the source of small secondary explosions. In the two months since the March-April explosions, as much as 20 m of erosion has taken place in some areas and fan deposits have formed at the base of the volcano. May activity and flood. Lakes formed behind natural dams of new pyroclastic flow deposits at several sites around the volcano. The largest lake, in the valley of the Río Magdalena at the SW foot of the volcano, grew about 1 m deeper each day until 26 April, then more slowly, eventually reaching 5 km in length and several million m3 in volume. Late 26 May, the pyroclastic dam holding back this water failed. Seismographs recorded the draining of the lake over a period of about 1 hour, sending a flood of hot water downstream. At Ostuacán, more than 10 km from the dam, the water temperature was measured at 82°C. Most residents of low-lying areas had been evacuated, but at a hydroelectric project 35 km downstream one worker was killed and three were badly burned by 52°C water. The flood also destroyed a bridge several kilometers from the pyroclastic dam. Geologists inspecting the former lake bed in early June saw a series of strand lines several meters high, indicating that the lake had been draining slowly before the dam failed. No large explosions have occurred at El Chichón since 4 April. Minor ash emission continued through early May but none has been reported since the 11th. A four-station Instituto de Geofísica seismic net N of the volcano recorded 4-7 very small events per day in late May. By late May, significant revegetation had begun in some areas devastated by the eruption. Near Nicapa (~ 7 km NE of the summit), coconut trees totally denuded by the 4 April explosion showed new leafy growth. Some residents had returned to Nicapa and cattle were grazing in the area. Closer to the summit, fields that had been completely buried contained tufts of grass about 1/3 m high. Stratospheric cloud. The major stratospheric cloud ejected by El Chichón has remained concentrated over lower northern latitudes, but lidar data and observations of brilliant sunsets appeared to indicate the beginning of significant northward dispersal in early June. However, with NASA's SAGE satellite no longer functional, determination of the extent of the cloud at any given time is very difficult. Through mid-May, wind data from Hilo, Hawaii showed a strong (up to 240 km/h), steady W to E flow between 10 and 20-22 km altitude, and a steady, 50-60 km/h E to W flow above 25-26 km. Between these levels, winds were light and variable. No significant N-S component had developed above 10 km since the El Chichón eruption. Lidar at Mauna Loa, Hawaii and Fukuoka, Japan continued to detect dense layers of stratospheric material through early June, at altitudes of as much as 32 km over Hawaii. University of Wyoming balloon flights from Laredo, Texas 17-19 May passed through two primary layers, at 15-20 km and 24-27 km altitude. In the upper layer there were more than 500 particles of less than 0.01 µm/cm3 and about 20 particles larger than 1 µm/cm3. April 1982 NOAA 7 satellite data between 120°E and 122.5°W showed an apparent increase in albedo (visible band) and an apparent decrease in outgoing longwave radiation (thermal infrared band) between 15°N and 35°N, peaking at 23°-26°N, when compared with the zonal average from the previous 4 years. Further analysis of samples collected 5 and 7 May during NASA Ames Research Center flights south from San Francisco shows particles ranging from less than 0.1 µm to several µm at the base of the cloud (about 19 km altitude). Silicates and halite crystals of several µm in size were found. Halite concentration was only a few percent of the amount of H2SO4 sampled, but H2SO4 was not as dominant as in many previous volcanic clouds. Geologists suggested that the halite sampled by NASA and anhydrite found in tephra near the volcano are probably the result of contamination by evaporites, which were found in bedrock penetrated by two Petroleos Mexicanos drillholes near El Chichón. From Tucson, Arizona on 14 May, Aden and Marjorie Meinel observed a roughly 40 X 400 km band of smoky clouds pass overhead during the afternoon, but at sunset these clouds appeared to be at an altitude of only 8 km. A dense veil covered the sky 15-16 May. A brilliant fiery red glow appeared 35 minutes after sunset on 16 May. The top of this glow was at 24 km, the highest altitude observed from Tucson thus far. A feature similar to Bishop's Ring was observed 17 May and windrows of aerosol moved over Tucson later that afternoon. A dense veil was present 18 May but was nearly gone on the 19th and skies were almost normal early 20 May. From Kitt Peak National Observatory near Tucson, extinction of two times normal at 3,900 was measured in mid-May. Scattering was about equal at all wavelengths except near-infrared, where the cloud was more transparent. Unusual twilight colors were observed through mid-May from Flagstaff, Arizona, and extinction coefficients measured there were about three times the normal value [Livingston and Lockwood, 1983]. A strong haze has been present over Houston, Texas since early May. Spectacular sunsets were observed there in late May and early June and the haze blotted out stars during the night of 2-3 June. Similar conditions plus a Bishop's Ring were seen from Austin, Texas during the night of 5-6 June. From Norwich, England, H.H. Lamb observed a rose-colored pillar of light at sunset 27 April and 9 May. At sunset 10-12 May, this phenomenon was accompanied by brilliant orange to fiery red diffused light that extended to 3-4 sun diameters. Strongly diffused light extended 2-3 diameters from a fiery red sun on 23 May. From the dimensions of the extended twilight illumination, Lamb estimated that the layer was at very roughly 20 km altitude. Lamb saw no abnormal effects on other evenings, although poor weather frequently made observations impossible. By early June, lidar observations and reports of unusual sunsets indicated that the cloud was beginning to move northward. Lidar operated by NASA at Hampton, Virginia (37.1°N, 76.3°W), began to detect layers at higher altitudes in early June. After a brilliant sunset on 14 June, a dense layer at 20.2-23.1 km was accompanied by material at 26.5 km. However, as of early June, lidar stations in Italy and West Germany had not detected layers at these altitudes. Enhanced sunsets with definite striations began 4 June in Boulder, Colorado and continued for the next several days. Residents of Jacksonville, Florida also began to see brilliant sunsets 4 June. Further References. Guerrero, J.C. (ed. ), 1983, El Volcán Chichonal: Instituto de Geología, Universidad Nacional Autónoma de México, 100 p. (9 papers). Havskov, J., de la Cruz-Reyna, S., Singh, S.K., Medina, F., and Gutiérrez, C., 1983, Seismic activity related to the March-April, 1982 eruptions of El Chichón Volcano, Chiapas, México: Geophysical Research Letters, v. 10, no. 4, p. 293-296. Livingston, W., and Lockwood, G.W., 1983, Volcanic ash over Arizona in the spring of 1982: Astronomical Observations: Science, v. 220, p. 300-302. Luhr, J.F., and Varekamp, J.C. (eds. ), 1984, El Chichón Volcano, Chiapas, México: JVGR, v. 23, no. 1/2, p. 1-191 (8 papers). Sigurdsson, H., Carey, S.N., and Fisher, R.V., 1987, The 1982 eruptions of El Chichón Volcano, México (3): Physical Properties of Pyroclastic Flows: BV, v. 49, p. 467-488. Information Contacts: L. Silva M., J-J. Cochemé, S. de la Cruz-Reyna, F. Medina, M. Mena, J. Havskov, S. Singh, UNAM, México; R. Canul D., Comisión Federal de Electricidad, Morelia; R. Tilling, USGS, Reston, VA; W. Duffield, USGS, Menlo Park, CA; W. Fuller, NASA Langley Research Center; T. DeFoor, MLO, Hawaii; M. Hirono, Kyushu Univ. ; B. Mendonça, NOAA/ERL; J. Rosen, Univ. of Wyoming; R. Chuan, Brusnwick Corp.; M. Matson, NOAA/NESS; A. & M. Meinel, W. Livingston, Univ. of Arizona; B. Skiff, Lowell Observatory; M. Helfert, NOAA, Houston TX; H. Lamb, Univ. of East Anglia; J. Nania, Deaconess Hospital, Spokane, WA; Numero Uno newspaper, Tuxtla Gutierrez. No large explosions have occurred at El Chichón since 4 April and weak ash emission was last observed 11 May. Minor microseismic activity was continuing in early July. The large stratospheric cloud ejected by the 4 April explosion remained dense over lower northern latitudes, but lidar measurements indicated that gradual northward dispersal was continuing. Pyroclastic flows and casualties. Major erosion of pyroclastic flow deposits around El Chichón (figure 3) has taken place since the eruption. Some small accumulations of water remain associated with these deposits, but there have been no recent observations of large lakes such as the one that produced a fatal flood 26 May. The largest eruption killed many people in and near the village of Francisco León (~ 5 km SW of the summit), but initial reports that all of its residents died were incorrect, according to an American missionary who had lived in the village for many years. Many villagers who had fled the heavy tephra falls from the initial explosions 28-29 March, however, returned a few days later. About 140 residents of the village itself and a similar number from the countryside nearby were killed by the pyroclastic flow that destroyed the village 4 April (SEAN 07:05). Figure 3. Areal distribution of pyroclastic flows and the three major surge deposits from the March-April 1982 eruption. Surges S-1 and S-2 were associated with the first 4 April explosion and the smaller S-3 surge with the second 4 April explosion. From Sigurdsson, Carey, and Fisher (1987). Stratospheric cloud. A late April-early May NASA flight collected stratospheric material at altitudes above 18 km over the western U.S. (including Alaska). The flight crew reported unambiguous evidence of the cloud as far N as the US-Canada border and estimated that it reached more than 21 km altitude. A preliminary examination of the material collected showed that it was a well-sorted assemblage of 5-10 µm plagioclase crystals and silicic glass, with a small amount of a mafic mineral (probably an amphibole) and traces of a Ca and S-rich mineral (probably a Ca sulfate). . . .
Information Contacts: S. de la Cruz-Reyna, L. Silva M., UNAM, México; R. Tilling, USGS, Reston, VA; W. Wonderly, Albuquerque, NM; J. Gooding, NASA, Houston. The major stratospheric cloud remained dense over lower northern latitudes. It has been estimated to cover the earth from S of the equator to as far N as Japan between 21 and 33 km altitude and to average 9.6 km thick. Lidar measurements and reports from England indicated that gradual northward dispersal was continuing. Information Contacts: W. Fuller, NASA; M. Hirono, Kyushu Univ., Japan; H. Lamb, Univ. of East Anglia, England. Seismicity continued to decline in August and no eruptive activity has been reported. There was a large increase in the volume of radon emitted after the initial explosion 28 March, but it has been declining since then. Information Contacts: S. de la Cruz-Reyna, UNAM, México. A small ash ejection, lasting only a few minutes, occurred on 11 September, the first eruptive activity reported since minor ash emission stopped in early May. Instruments near the volcano recorded a slight increase in seismicity beginning 26 August, to a few very small events per day, and seismic activity remained at this level through late September. There have been no reports or evidence of lava dome extrusion (a large summit dome was destroyed by the March-April explosions). By September, the three lakes that covered much of the crater floor after the March-April explosions had coalesced into two larger lakes. Heavy rains have washed out most of the roads near the volcano and have made field work extremely difficult. In late October, after the end of the rainy season, geologists will climb the volcano and sample gases. Residents of the municipio of Francisco León, destroyed by a pyroclastic flow 4 April, estimate that about 400 people in the area were killed by the eruption, and the Catholic diocese of Tuxtla Gutiérrez has a list of more than 1,000 persons believed to have died. The eruption was also reported to have killed most of the birds near the volcano. As a result, insects multiplied and devoured crops planted at the beginning of the rainy season, leaving many farmers without food. Coffee, which normally provides a cash crop, survived the eruption but appears unlikely to produce any beans in 1982. The Mexican government has resettled people from heavily damaged villages onto land in other parts of the state of Chiapas. By the end of July, few of the 60,000 refugees from the eruption remained in temporary camps. Information Contacts: S. de la Cruz-Reyna, UNAM, México; W. Wonderly, Albuquerque, NM; R. Engel, Instituto Lingüístico del Verano, México. As of early November, no new eruptive activity has been reported from El Chichón since the small ash ejection of 11 September described last month. Mexican and American geologists flew over the volcano on 4 November (during the NASA mission to observe the stratospheric cloud ejected 4 April). Little new vegetation could be seen on the volcano and 1ahar deposits were evident in stream valleys. The two crater lakes observed in September had combined into a single bright yellow-green lake that covered more than 80% of the crater floor. A sulfur slick covered the lake and sulfur deposits were visible along its shore. Vapor was emitted from 6-8 vents distributed around the shore and churning of the lake water indicated that gases were also emerging from sources beneath its surface. The gas emission fed a relatively diffuse, low-altitude plume that was visible within ~ 15 km of the volcano. Filter samples collected from the NASA aircraft showed that the plume was relatively poor in ash. The ratio of NO (measured by a chemoluminescent technique) to total sulfur gases (analyzed by flame photometry) was an order of magnitude higher in the El Chichón plume than at Arenal, Poás, Colima, and Mt. St. Helens during similar sampling in February. H2S made up more than 95% of the sulfur gases in the plume. Michael Matson provided additional data on the initial heights and subsequent directions of movement of different layers of the eruption clouds from the largest El Chichón explosions (table 1). Blackbody temperatures of the tops of dense eruption columns are determined from GOES East geostationary weather satellite digital data, and are compared to temperature/altitude profiles from radiosondes launched from Veracruz, México (19.15°N, 96.12°W) at 0600 and 1800 daily. Note that the cloud top temperatures are usually for eruption columns that have just been ejected from the volcano and thus have not yet reached their maximum altitudes. Accurate temperatures cannot be assigned to diffuse plumes because data from the plume are mixed with data from the underlying terrain. However, their direction and speed of drift can be measured on a series of satellite images and then compared with known wind directions and speeds at various heights (in this case from the Veracruz radiosondes) to estimate altitudes. Further Reference. Carey, S.N. and Sigurdsson, H., 1986, The 1982 Eruptions of El Chichón Volcano México (2): observations and numerical modelling of tephra-fall distribution: BV, v. 48, no. 2/3, p. 127-141. Information Contacts: J. Friend, Drexel Univ. ; S. de la Cruz-Reyna, UNAM, México; M. Matson, NOAA/NESS. Data from ground-based lidar distant from El Chichón indicated that the dense portion of the stratospheric cloud ejected 4 April was spreading slowly northward. However, at low latitudes, where dense aerosols have been observed since shortly after the eruption, both the altitudes and concentrations of the strongest layers have decreased noticeably in November. Information Contacts: P. McCormick and W. Fuller, NASA; R. Reiter, Garmisch-Partenkirchen, W. Germany; T. DeFoor, MLO; M. Hirono, Kyushu Univ., Japan; S. Hayashida, Nagoya Univ., Japan; T. Fujita, Meteorological Research Inst., Japan; E. Brooks, Saudi Arabia; A. Strong, NOAA. No new explosions were reported from El Chichón through early January and seismicity remained at very low levels. Atmospheric data indicated continued dispersal of the dense part of the stratospheric aerosol cloud ejected by El Chichón's 4 April eruption. Scientists from UNAM's Instituto de Geofísica, Michigan Technological Univ., the Univ. 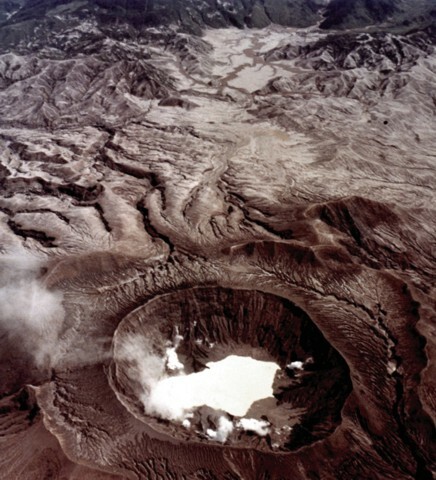 of Maryland, and the USGS visited El Chichón 26-29 January 1983, the first time that observations were made within the active crater since the devastating March-April 1982 eruption. The expedition was made with helicopter support provided by the governments of the states of Tabasco and Chiapas. The following is from the scientific team's report. "The crater was geologically mapped and rocks and gases were sampled extensively. There was no evidence of any eruptive activity since at least 3 November, when excellent NASA photography was obtained. Extensive gas emission was still occurring from vents under and adjacent to the crater lake. The emissions were H2S-rich, apparently partly because the lake (temperature 52°C, pH 0.56) and the ground water were selectively extracting SO2. Most of the fumaroles were drowned by ground water, had temperatures between 90° and 115°C, and were audibly emitting steam. One fumarole on the SW side of the crater had a temperature of 446°C. The crater as a whole typically had H2S concentrations of 2-6 ppm, which required special precautions for the scientists. Seismic activity and landsliding were at a very low level. "Geologic observations document two pre-1982 dome extrusion periods and two periods of pyroclastic flows in the crater wall stratigraphy, as well as domal units extruded on the somma or ring fracture around the crater. "The level of the crater lake was receding of 2-3 cm/day during the period of observations. The high water mark of the lake coincided with the NASA flight in early November when it was 60 cm higher than in January. The recession correlated with a deepening of color in the lake and may in part have been due to the end of the rainy season." Information Contacts: S. de la Cruz-Reyna, R. Mota P., and M. Mena J., UNAM, México; W. Rose, Jr., T. Bornhorst, S. Halsor, P. Plumley, and W. Capaul, Michigan Tech. Univ. ; W. Zoller, Univ. of Maryland; T. Casadevall, USGS. Geologists who left the volcano 10 February reported that activity at that time was limited to vapor emission from vents in and around the crater lake. No eruptive activity had been reported as of early March. Information Contacts: H. Sigurdsson, Univ. of Rhode Island. UNAM geologists visited El Chichón 20-24 April. Fumarolic activity continued but there was no evidence of any recent ash ejection. Variations observed in the size of the fumarole plumes were thought to be caused by changes in temperature and humidity. Portable seismometers on the crater rim 21-23 April detected only two small events in 26 hours. The shore of the crater lake had receded 38 m (horizontally) since November 1982 (when the lake was roughly 500 m long, 300 m wide, and a maximum of 50 m deep), and about 30 m of the shrinkage had taken place since the previous measurements in January. Less than a week after geologists left the volcano major additional shrinkage of the lake was reported, and as of early May the lake occupied less than half the area it had covered 24 April. Pilots overflying the volcano were asked to report further changes in the lake, but no reports had been received as of 11 May. Data from a telemetering seismometer 16 km SSE of the volcano showed no change in seismicity through 4 May. A team of scientists descended into the crater during the week of 16 October. They found no new tephra or other signs of recent eruptive activity. The temperature of the crater lake had decreased to 42°C from 52-58°C during the previous descent in late January. The lake had receded substantially between the late January visit and observations from the crater rim 21 April but lake level was not appreciably lower in October. Average fumarole temperatures had dropped from 116°C in January to 99° in October. In the talus rampart just above the crater floor, a small low-pressure fumarole that had registered a temperature of 446°C in January was no longer active in October. No other notable changes in fumarole position were noted. No significant seismic activity has been recorded at El Chichón in recent months although some tectonic seismicity has occurred SE of the volcano. Further Reference. Casadevall, T., de la Cruz-Reyna, S., Rose, W.I. Jr., Bagley, S., Finnegan, D.L., and Zoller, W.H., 1984, Crater lake and post-eruption hydrothermal activity, El Chichón Volcano, México: JVGR, v. 23, p. 163-191. A team of scientists from UNAM and elsewhere visited El Chichón's crater lake on 15 February. There was no evidence of recent eruptive activity. Temperature (43°C) and pH (1.9) of the lake had changed little since the previous visit on 21 October 1983 (42°C and 1.8). High concentrations of H2S forced the geologists to leave after 40 minutes. Photographs taken in December 1983 showed little change in lake level since October; no information on lake level was available from the February visit. Information Contacts: S. de la Cruz-Reyna, UNAM; T. Casadevall, USGS. Weather satellite images 3-4 April showed a series of plume-like features originating from the vicinity of El Chichón. Data from the TOMS instrument on the Nimbus-7 polar orbiting satellite 9.5 hours after the last plume observation showed no enhancement in SO2 over the area. However, cloud elevations were estimated at 13.5 km and this prompted an on-site investigation. Servando de la Cruz visited the volcano and found no evidence that an eruption had occurred. There was no change in the appearance of the crater, crater lake, or outer flanks, and no sign of any recent tephra deposits. Since the 15 February visit, temperatures of the crater lake (36-37°C) and fumaroles (96-98°C) had declined slightly, and the crater lake level was somewhat lower after several weeks of very little rainfall. de la Cruz noted that smoke produced by the centuries-old practice of burning the remains of the corn plants after the harvest might have looked like eruption plumes on the satellite imagery, although corn is not the most common crop in the immediate vicinity of the volcano. Information Contacts: S. de la Cruz-Reyna, UNAM; A. Krueger, NASA GSFC; M. Matson, NOAA/NESDIS; T. Casadevall and R.. Tilling, USGS. A magnitude 3 earthquake centered 20 km NE of El Chichón occurred 28 September at 0956 GMT. Residents of Pichucalco (23 km NE of the volcano) and other nearby towns reported that they felt the earthquake. Geologists visited the volcano on 30 September. The crater interior and lake were essentially unchanged. Since November 1985, the crater lake water temperature has been 28.6°C, in equilibrium with the environment. Fumaroles in the N part of the crater had temperatures of about 97°C. No relationship between the earthquake and the volcano has been established. Information Contacts: S. de la Cruz-Reyna, UNAM; J. Romeo León Vidal, Sismología del Sureste C. F. E., Tuxtla Gutierrez, Chiapas, México. "Recent reports of increased activity at El Chichón motivated a visit to the region. Analysis of records from nearby seismic stations (the nearest at Ostoacán, 115 km NW) showed no increased seismicity. A helicopter flight over the volcano on 10 November allowed observation of hydrothermal activity that had increased from last year's levels. The crater lake, which in the last few years had shrunk to a small pond, had recovered to the level of November 1982, and hydrothermal activity was similar to that observed in January 1983 (as described in Casadevall and others, 1984). The greenish-yellow lake now covers most of the crater floor, and numerous small fumaroles release steam through and around it. This activity is probably a result of the increased rainfall that reached 3,829 mm in the area January-October, compared to 3,219 mm measured during the same period last year. This increase was particularly high in October 1990, when 1,069 mm of rain was reported, compared to 701 mm measured in October 1989. As expected, no evidence of the start of a dome growth episode has been detected." Reference. Casadevall, T., de la Cruz-Reyna, S., Rose, W.I., Bagley, S., Finnegan, D.L., and Zoller, W.H., 1984, Crater lake and post-eruption hydrothermal activity, El Chichón Volcano, México: JVGR, v. 23, p. 169-191. Information Contacts: S. de la Cruz-Reyna, UNAM. ; Romeo León Vidal, CFE, Tuxtla Gutiérrez, Chiapas, México. 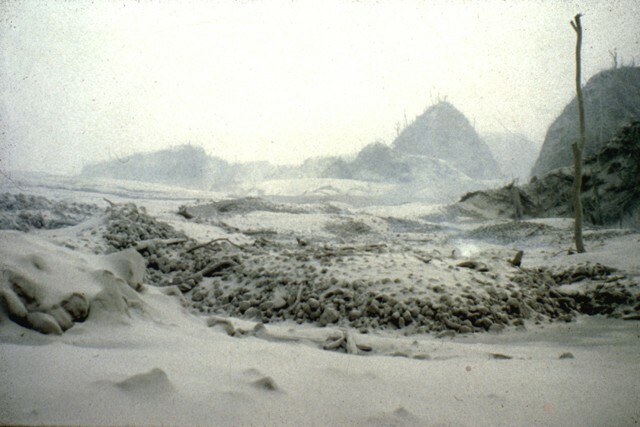 The following, from José Luís Macías, Arturo Macías, Jean-Christophe Komorowski, Claus Siebe, and Robert Tilling, describes observations during fieldwork 18 April-21 May 1992, ten years after the major 1982 eruption. Geology. We made several visits to the crater. The very significant erosion that has occurred in the last 10 years allowed us to descend relatively easily into the crater through its SE wall, where the rim's altitude is 1,060 m. The crater floor is at 900 m elevation. The only changes that we noticed during our visits were caused by frequent rockfalls from the crater walls. Between the first and second visits, on 19 April and 3 May, new crater-floor rockfall deposits had originated from the SE crater wall. Recently exhumed fault planes veneered by secondary mineralization in the crater wall were also quite common. On the SE part of the rim, a fracture system 90 m long, 6-9 cm wide at its SE end, and 0.2-8 cm wide at the NE end, trended N 65°E, and was associated with mild fumarolic activity. The fracture cuts through bedded domal talus breccia mapped by Rose and others (1984) and might evolve to produce rockfalls in the near future. Several other curviplanar slump fractures encompass apparent areas of several hundred square meters on the crater wall. Thus, more vigorous rockfall activity might be expected, particularly during the coming rainy season or periods of heightened regional seismic activity. People living near the volcano reported an eruption in late March or early April that produced light ashfall near the volcano, and was accompanied by loud, thunder-like noises. We think that the ashfall most likely was dust produced during large rockfalls from the crater walls, and the noise was the sound of the rockfalls. Eruption-like dust clouds produced by rockfall activity have been described at Kilauea by Tilling (1974) and Tilling and others (1975). To try to reduce local alarm, J.L. Macías and J.-C. Komorowski described the current activity and their interpretations of it during an informal conference on 19 May with residents of Chapultenango (11 km ESE of the crater), local authorities, and a group of elementary school teachers. Rumors in El Volcán (5 km E of the crater) that the volcano would erupt on its 10th anniversary caused many women and children to leave their homes. Crater lake. Temperature and acidity of the crater lake were measured three times at two different sites (table 2). Lake temperature had increased from 28.6°C in 1986 to more than 40° in May 1992, nearing the 42° of October 1983 and February 1984. The pH values of 1.8 and 1.9 measured in 1983 and 1984, respectively, were similar to the April 1992 value. Although no heavy rainfall occurred between 18 April and 8 May, brief rains were common at night and may have diluted the lake with meteoric water, raising its pH. Water samples collected on the lake's N shore are being studied by M.A. Armienta and S. de la Cruz-Reyna at the Instituto de Geofísica, UNAM. Table 2. Temperature and acidity of the crater lake at El Chichón, measured at sites on the SE and N shores. Fumarolic activity. Gas emission from the crater fed a low-altitude plume visible on clear days. Fumarolic activity was observed throughout the crater but was much more extensive and vigorous in its NNE sector (steaming ground zone of Casadevall and others, 1984). Almost all of the fumaroles showed a steady, audible release of overpressured gas, except for one just N of the crater lake, where frequent noise changes showed that output was distinctly discontinuous. At times, vapor formed only within about 1 m above this vent, suggesting that the gas is initially superheated. All of the fumaroles produced sublimates, primarily native sulfur. A high-temperature fumarole NE of the crater lake contains molten orange sulfur within the orifice of a 1-m-high feature otherwise covered with needle-like amorphous yellow sulfur. Numerous mildly steaming areas were found in the NW and NE parts of the crater, and small fumaroles were active several tens of meters above the crater floor along the path descending from the SE crater wall. Relict portions of altered brecciated trachyandesite described by Rose and others (1984) as remnants of the pre-1982 dome and shown on the map of Casadevall and others (1984) as "altered areas" are still actively steaming. The crater lake, which had recovered to November 1982 levels by November 1990, was turquoise-blue and had at least two large zones of intense surface effervescence as described by Casadevall and others (1984). Although an acrid smell was noted at active hydrothermal areas, H2S concentrations must have decreased below the 2-6 ppm that forced geologists to take special precautions in 1983 and to leave the crater in 1984. During several 4-hour periods in the crater, we never needed gas masks, even in the most active areas. Other observations. In the Río Magdalena near Xochimilco (8 km NW of the crater), vegetation has made a strong comeback on pyroclastic-flow deposits, which are now covered by tall grasses and acacia trees up to 2 m high with trunks several centimeters in diameter. In all other areas within 2-3 km of the crater, the 1982 deposits are covered only by moss, lichen, and tall grass. Where pyroclastic flows and surges did not surmount topographic barriers or deposited only a thin veneer of material, vegetation is much more lush, with trees, ferns, and other broad-leafed tropical plants. Trees that were charred but not totally blown down >5 km away have begun to grow again from their stumps. 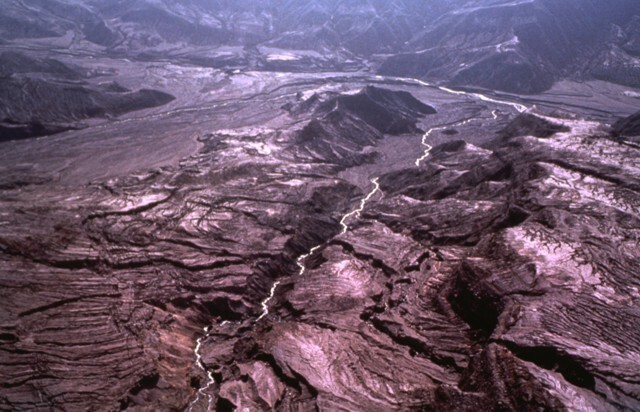 The river that now passes through El Volcán was formed after the pyroclastic flows changed the former drainage pattern. An abundant, rusty colored precipitate (Fe oxides) was sampled for analysis. Future work. More extensive field observations within the crater are planned for November or December. We will measure temperature and pH, and sample sites of hydrothermal activity. An attempt will be made to overfly the crater with a COSPEC, to bring portable seismometers into the crater and somma flanks, and to make bathymetric measurements. References. Casadevall, T., de la Cruz-Reyna, S., Rose, W., Bagley, S., Finnegan, D., and Zoller, W., 1984, Crater lake and post-eruption hydrothermal activity, El Chichón Volcano, México: Journal of Volcanology and Geothermal Research, v. 23, p. 169-191. Rose, W., Bornhorst, T., Halsor, S., Capaul, W., Plumley, P., de la Cruz-Reyna, S., Mena, M., and Mota, R., 1984, Volcán el Chichón, México: pre-1982 S-rich eruptive activity: Journal of Volcanology and Geothermal Research, v. 23, p. 147-167. Tilling, R., 1974, Rockfall activity in pit craters, Kilauea Volcano, Hawaii: Proceedings of the Symposium on "Andean and Antarctic Volcanology Problems", IAVCEI, Santiago, Chile, September 1974, p. 518-528. Tilling, R., Koyanagi, R., and Holcomb, R., 1975, Rockfall seismicity-correlation with field observations, Makaopuhi Crater, Kilauea Volcano, Hawaii: Journal of Research, U.S. Geological Survey, v. 3, p. 345-361. Information Contacts: José Luís Macías V. and Michael Sheridan, State Univ of New York, Buffalo, NY; Jean-Christophe Komorowski and Claus Siebe, Instituto de Geofísica, UNAM; Robert Tilling, USGS. The following reports the results of fieldwork on 5-11 August. "Reports of strange noises and vibrations in the small town of Coapilla, 21 km S of El Chichón, caused some concern among the population, since rumors that an eruption should be expected on the 10th anniversary of the 1982 catastrophic eruptions were spreading across Chiapas state. To help the local government to dismiss (or confirm) those rumors, a special trip was made to deploy three portable seismic stations around the volcano, and to obtain more samples of the crater-lake water. The seismic stations were located in Coapilla, Chapultenango (11 km ESE of the summit), and Ostuacán (12 km NW). Due to local ground noise, only the Chapultenango station could be set at a relatively high gain. During the seismic recording, the volcano was visited to obtain samples. On 8 August at 0922, while two of the geologists (J.L.M. and M.A.C.E.) were collecting rock samples on the rim of the outer crater, a small earthquake was detected by the Chapultenango station. At that time, an impulsive shake, accompanied by an explosion-like sound, was reported by the geologists at the crater rim. Although they could not look into the crater from the outer rim, they observed no signs of explosion, dust, or increased fumarolic activity. The nature of this event is difficult to interpret, since only one station detected it, but the waveform is similar to some explosion earthquakes recorded elsewhere. "The Coapilla noises and vibrations were found to be produced by the town's water-piping net. "The water sample (taken about 1 hour before the seismic event) shows a composition similar to other recent samples. The overall trend in the last few years is toward an increase in pH and a decrease in concentration of major species." Information Contacts: S. De la Cruz-Reyna, Z. Jiménez, J.M. Espíndola, and M.A. Armienta, UNAM; Marco A. Cuesta Escobar, Raul García Santiago, Edipson Pastrana Vázquez, and Silvia Ramos Hernández, Coordinación de Investigación, Consejo Estatal de Fomento a la Investigación y Difusión de la Cultura, Chiapas, México; J.L. Macías, State Univ of New York, Buffalo, NY. Fieldwork on 11-18 January revealed continued fumarolic activity around the crater lake and crater walls as observed in June 1992 (17:06). The boiling mud and water ponds remained active. Geyser-like fumaroles emitted a gas phase only, and extensive mud cracks indicated an 85 cm drop in the level of the crater lake. The changes were probably due to the decrease in rainfall during December and January. The drop in lake level prevented temperature and pH measurements at the same sites sampled last June. Two new sites were chosen. Site 1, which better reflected the ambient conditions of the lake because of the absence of nearby fumaroles or boiling zones, had a temperature of 30.7°C and a pH of 2.3. The temperature at site 2 was 66.6°C and its pH was 1.7. Analysis of a water sample taken at site 1 indicated that the lake has remained chemically stable since 1992 except for minor boron variations. On 13 January, two apparent phreatic explosions similar to one reported last year were heard and felt on the crater rim. A small rockfall avalanche on the SE inner wall of the crater followed the first explosion. Information Contacts: José Luis Macías, Michael F. Sheridan, and Carmelo Ferlito, SUNY, Buffalo, NY; Juan Manuel Espíndola, Servando De la Cruz-Reyna, and M. Aurora Armienta, Instituto de Geofísica, UNAM. The activity and appearance of El Chichón during 17-27 May resembled that observed in 1992 and 1993. Since last visited in February 1993, several rockfalls had occurred from the inner crater wall. A major rockfall in the S part of the crater was probably associated with a 90-m-long fracture system observed in May 1992. Lake level at El Chichón has continued to decline since 1992, dropping a total of 2 m (0.85 m from 1992 to 1993, and 1.15 m since 1993). Several terraces representing stationary lake levels were visible. The acidity and temperature of the lake water were similar to 1992 and 1993. Data were collected at two sites similar to those chosen in 1993. Site 1, which better reflected the typical ambient conditions, had a pH of 2.15 and a temperature of 33°C. Site 2 had slightly higher readings: a pH of 2.21 and a temperature of 34.5°C. Fumarolic activity was still predominant in the N part of the crater, consistent with 1993 observations. The fumaroles produced 100°C vapor-rich emissions with abundant sulfur sublimates. Seismicity remained normal during the visit. Two portable seismometers were set up on the moat area and run for 80 hours. During this period, 21 shallow events with coda magnitudes <1.8 were registered. Some evidence from wave form and polarity suggested both tectonic and internal explosion sources for these events. Prior to 1982 this relatively unknown volcano was a heavily forested lava dome cluster of no greater height than adjacent non-volcanic peaks. The major 1982 high-sulfur explosive eruptions were accompanied by devastating pyroclastic flows and surges, destroying the summit lava dome and creating a new ~1-km-wide crater now containing the acidic crater lake. Information Contacts: Jose Luis Macias, Juan Manuel Espindola, Zenon Jimenez, and Yuri Taran, Instituto de Geofisica, UNAM. Slight variations in lake water temperature and migration of thermal fields on the crater floor were noticed during an April 1998 visit. Erosion had started to form deeply incised gullies in the crater walls, producing small rockfalls around the crater. Rockfall activity continued along the S crater wall as in 1995 (BGVN 20:05). The latest rockfall deposit contained blocks up to 3 m in diameter. According to bathymetric data obtained during the April visit, the average depth of the lake is only 1.5 m. On the lake bottom several funnel-shaped areas about 5-6 m below the surface discharged bubbling gases. No elemental sulfur was found in samples of lake sediments. The surface temperature of the lake is very uniform, and even above the gas funnels did not exceed 35°C. Such uniformity may indicate that the lake water is not significantly influenced by underlying magma and is highly affected by seasonal variations in precipitation and ambient temperature. The lake's surface maintained the same elevation in May 1996 and January 1997, but during the April 1998 visit it was 1 m higher. Hydrothermal activity inside the crater in April was compared to observations made in January 1997. Since then, two boiling pools on the NW side of the crater had dried out, but three new large boiling pools 5-10 m in diameter had appeared 100 m to the S. The boiling pools gave off much more vapor than earlier. The Soap Pool, a boiling spring that had an outflow rate of ~20 kg/s in 1996-97, had decreased to an outflow of only 6-7 kg/s of very saline boiling water. A large area around this pool was covered by a crust of a white salt precipitated from the pool water. Discharge estimates for the volcano-hydrothermal system were made in April: springs on the southern slopes of the volcano and the Soap Pool inside the crater discharged at least 300 kg/s of thermal water. The steam output from the crater (from fumaroles with elevated temperatures) did not exceed 20 kg/s. Temperature and chlorine concentration of these springs are recorded in table 3. Table 3. Temperatures and chlorine concentrations of thermal water springs at El Chichón as measured in April 1998. Data courtesy of Instituto de Geofisica, UNAM. El Chichón is located in a heavily forested mountainous area in Chiapas, 670 km ESE of México City. 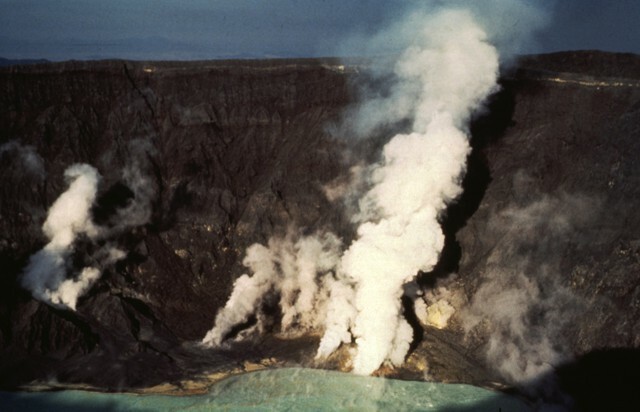 No historical eruptions were known before the Plinian eruption in 1982, although solfataras and hot springs were present in the summit area and on the flanks. The 1982 explosions destroyed the summit dome creating a 1 km wide crater. Information Contacts: Yuri Taran, Jose Luis Macias, Juan Manuel Espindola, and Nicholas Varley, Instituto de Geofisica, UNAM, Ciudad Universitaria, Coyoacan 04510, México D.F., México. 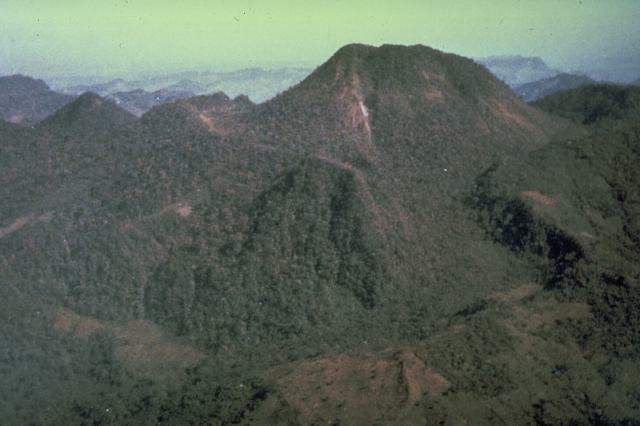 Since the eruptions of 1982, observations at El Chichón have indicated decreasing magmatic fluids. However, sampling in December 1999 revealed that this is no longer the case. 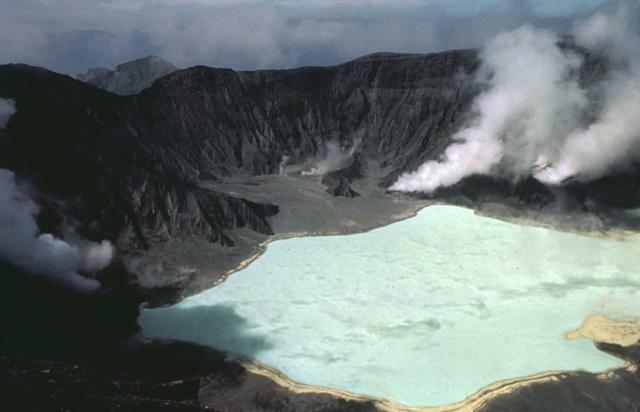 On 24 April 2000, water in El Chichón's crater lake had a temperature of 47°C. Previous temperatures had not exceeded 38°C since January 1983 when the lake reached 56°C. Boron concentrations, at 66 mg/L, were also the highest recorded values since January 1983. SiO2 values were 357 mg/L; this is the highest concentration since August of 1992. Sulfide, which had not been present in samples since 1993, was at 3.22 mg/L, the highest concentration ever recorded. At the time of the 24 April sampling, the crater lake covered approximately half of the bottom of the crater. This apparent increase in the level of the crater lake was the only significant change in El Chichón's morphology. Further Reference. Armienta M.A., De la Cruz-Reyna S., and Macías, J.L., 2000, Chemical characteristics of the crater lakes of Popocatepetl, El Chichón, and Nevado de Toluca volcanoes, Mexico: JVGR 97, p. 105-125. Information Contacts: Silvia Ramos, Monitoreo Volcanológioc y Sismológico, Chiapas, México, Río Cantela 221, Fracc Paraíso II, Tuxtla Gutierrez, Chiapas, México; M. Aurora Armienta, Instituto de Geofisica, UNAM, México 04510, D.F., México. King Freeland, a Villahermosa resident since 1981, has been taking photographs of El Chichón since 1985 and going into the inner crater yearly (figure 4). In September 2001 he reported that visible fumarolic activity in the crater had dropped during the previous six months and had changed to a new area of the crater. The level of the lake, normally dependent on rainfall, had lowered in the previous three months despite an increase in precipitation. Some of the streams on the outer flanks of the volcano had dried up for the first time in 15 years, and bubble activity was observed in the entire lake. In 1987, Freeland and others went swimming in the crater lake. In September he reported that the water was too hot to touch. Figure 4. Photo of the NE end of the ~ 900-m-wide crater of El Chichón, showing the drop in the water level that has occurred during July-September 2001. The photo was taken from the E wall of the crater facing NNW. The lake, lengthwise, is 1/2-1/3 the diameter of the crater. Courtesy of King Freeland. A recent article (Duffield, 2001) describes an oral tradition of the Chamula Indians, descendants of the Mayan culture. A story passed down through several generations tells of frequent earthquakes, a drying river, and a sudden flood of boiling water that nearly wiped out the ancient culture. Duffield relates the story to his studies of the 1982 eruption at El Chichón, during which many of the conditions of the eruption, including frequent earthquakes and several deaths by surges of very hot water, seem to correspond to the ancient oral tradition. Duffield noted that such oral traditions, although not scientifically provable, can provide valuable insight into events that have occurred in the past, and clues to those events that may occur in the future. Reference. Duffield, Wendell A., 2001, At least Noah had some warning: Eos, Transactions of the American Geophysical Union 82, p.305, 309. Information Contacts: King Freeland, Core Laboratories, Cerrada Av. Universidad 102, Col. Pino Suarez, C.P. 86020 Villahermosa, Tabasco, Mexico; Wendell A. Duffield, USGS, Flagstaff, Arizona, USA. 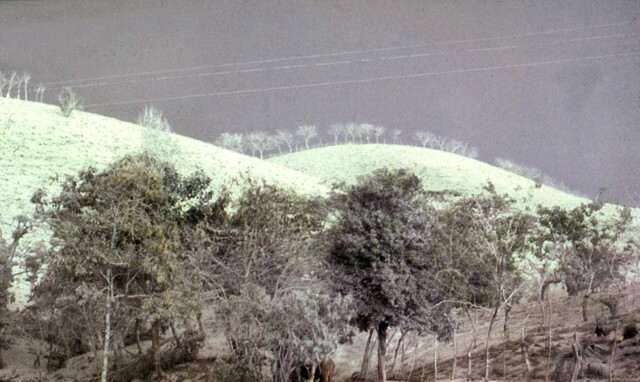 The Bulletin staff received numerous photographs of currently non-eruptive El Chichón from amateur photographer King Freeland; a few are included below. Some of Freeland's photos are wide-angle montages compiled from multiple photos using image-processing software. The photograph in figure 5 was taken in April 2004 and shows the warm, bright green, acidic crater lake. Figure 6 illustrates the central crater as it looked in May 2004 from the SE side of the volcano looking towards the WSW. Figure 5. Photograph taken in April 2004 from the SW crater rim of El Chichón showing the crater lake. Courtesy of King Freeland. Figure 6. The S side of El Chichón's inner crater, May 2004, looking toward WSW. Courtesy of King Freeland. Figure 7 depicts a sequence of what resemble stair steps developed on the pyroclastic deposits. Yuri Taran estimated the approximate height of these "steps" as 0.5-1 m, but the photographer Freeland suggested a height of up to 3 m. Taran and Freeland both offered that the features may result from the work of water, and Taran also suggested wind as a possibility. Figure 7. Broken 'stair-stepped' surface developed on pyroclastic deposits at El Chichón. The inset at upper right is a blow-up of a representative area in the photo's center. The photo was taken in 2004. Courtesy of King Freeland. Taran lamented the lack of people studying these features, even though they appeared quite spectacular, stating "We need a team of geographers to study this type of erosion, soil formation..." Many of Freeland's other photos in our archives also depict fumarolic and hydrothermal features. Yuri Taran from the Institute of Geophysics, Universidad Nacional Autonoma de Mexico (UNAM), has been studying El Chichón volcano and its hydrothermal activity for almost 10 years (see Capaccioni and others, 2004). Taran noted that three groups of hot springs exist on the slopes of the volcano: Agua Caliente, S of the volcano with a maximum temperature of 74°C; Agua Salada, at the base of the dome, SSW from the crater, with a maximum temperature of 55°C; and Agua Tibia, NW of the crater with an estimated maximum temperature of ~ 51°C. The crater lake has variable shape and size, depending on the flow rate of a boiling spring in the crater that feeds the lake. When this spring sometimes disappears, the lake becomes smaller until an equilibrium develops between precipitation, evaporation, and seepage through the lake bottom. This 'equilibrium' lake size is quite small. Taran noted that during the period of his study the lake was smallest in November 1998 (at the end of the rainy season), and it was very shallow, ~1.3 m deep. References. Capaccioni, B., Taran, Y., Tassi, F., Vaselli, O., Mangani, G., and Macias, J.L., 2004, Source conditions and degradation processes of light hydrocarbons in volcanic gases: an example from El Chichón volcano (Chiapas State, Mexico), Chemical Geology, v. 206, nop. 1-2, p.81-96. Information Contacts: King Freeland, Distrito Reynosa 157, Fracc. Pages Llergo, Villahermose, Tabasco, CP86125, México; Yuri Taran, Instituto de Geofisica, Universidad Nacional Autonoma de México (UNAM), Ciudad Universitaria, Coyaocan 04510, México D.F., México (URL: http://www.geofisica.unam.mx/). El Chichón is a small, but powerful trachyandesitic tuff cone and lava dome complex that occupies an isolated part of the Chiapas region in SE México far from other Holocene volcanoes. Prior to 1982, this relatively unknown volcano was heavily forested and of no greater height than adjacent nonvolcanic peaks. The largest dome, the former summit of the volcano, was constructed within a 1.6 x 2 km summit crater created about 220,000 years ago. Two other large craters are located on the SW and SE flanks; a lava dome fills the SW crater, and an older dome is located on the NW flank. More than ten large explosive eruptions have occurred since the mid-Holocene. The powerful 1982 explosive eruptions of high-sulfur, anhydrite-bearing magma destroyed the summit lava dome and were accompanied by pyroclastic flows and surges that devastated an area extending about 8 km around the volcano. The eruptions created a new 1-km-wide, 300-m-deep crater that now contains an acidic crater lake. Armienta M A, De la Cruz-Reyna S, 1995. Some hydro-geochemical fluctuations observed in Mexico related to volcanic activity. Applied Geochem, 10: 215-227. Casadevall T J, De la Cruz-Reyna S, Rose W I, Bagley S, Finnegan D L, Zoller W H, 1984. Crater Lake and post-eruption hydrothermal activity, El Chichon volcano, Mexico. J. Volcanol. Geotherm. Res., 23: 169-191. De la Cruz-Reyna S, Mena M, Segovia N, Chalot J F, Seidel J L, Monnin M, 1985. Radon emanometry in soil gases and activity in ashes from El Chichon volcano. Pure Applied Geophys, 123: 407-421. Duffield W A, Tilling R I, Canul R, 1984. Geology of El Chichon volcano, Chiapas, Mexico. J. Volcanol. Geotherm. Res., 20: 117-132. Espindola J M, Macias J L, Tilling R I, Sheridan M F, 2000. Volcanic history of El Chichon Volcano (Chiapas, Mexico) during the Holocene, and its impact on human activity. Bull Volcanol, 62: 90-104. Garcia-Palomo A, Macias J L, Espindola J M, 2004. Strike-slip faults and K-alkaline volcanism at El Chichon volcano, southeastern Mexico. J. Volcanol. Geotherm. Res., 136: 247-268. Jimenez Z, Espindola V H, Espindola J M, 1999. Evolution of the seismic activity from the 1982 eruption of El Chichon volcano, Chiapas, Mexico. Bull Volcanol, 61: 411-422. Macias J L, Capra L, Arce J L, Espindola J M, Garcia-Palomo A, Sheridan M F, 2008. Hazard map of El Chichon volcano, Chiapas, Mexico: constraints posed by eruptive history and computer simulations. J. Volcanol. Geotherm. Res., 175: 444-458. Macias J L, Espindola J M, Bursik M, Sheridan M F, 1998. Development of lithic-breccias in the 1982 pyroclastic flow deposits of El Chichon Volcano, Mexico. J. Volcanol. Geotherm. Res., 83: 173-196. Macias J L, Espindola J M, Taran Y, Sheridan M F, Garcia A, 1997. Explosive volcanic activity during the last 3,500 years at El Chichon volcano, Mexico. IAVCEI Puerto Vallarta, Mexico Plenary Assembly, Excursion no. 6 Field Guide, p. 1-53. Macias J L, Sheridan M F, Espindola J M, 1997. Reappraisal of the 1982 eruptions of El Chichon volcano, Chiapas, Mexico: new data from proximal deposits. Bull Volcanol, 58: 459-471. McGee J J, Tilling R I, Duffield W A, 1987. Petrologic characteristics of the 1982 and pre-1982 eruptive products of El Chichon Volcano, Chiapas, Mexico. Geof Internac, 26: 85-108. Rose W I, Bornhorst T J, Halsor S P, Capaul W A, Plumley P J, De la Cruz-Reyna S, Mena M, Mota R, 1984. Volcan El Chichon, Mexico: pre-1982 S-rich eruptive activity. J. Volcanol. Geotherm. Res., 23: 147-168. Sigurdsson H, Carey S N, Espindola J M, 1984. The 1982 eruptions of El Chichon volcano, Mexico: stratigraphy of pyroclastic deposits. J. Volcanol. Geotherm. Res., 23: 11-38. Taran Y A, Fischer T P, Pokrovsky B, Sano Y, Aurora-Armienta M, Macias J L, 1998. Geochemistry of the volcano-hydrothermal system of El Chichon volcano, Chiapas, Mexico. Bull Volcanol, 59: 436-449. Tilling R I, Rubin M, Sigurdsson H, Carey S, Duffield W A, Rose W I, 1984. Holocene eruptive activity of El Chichon volcano, Chiapas, Mexico. Science, 224: 747-749. There is no Deformation History data available for El Chichón. 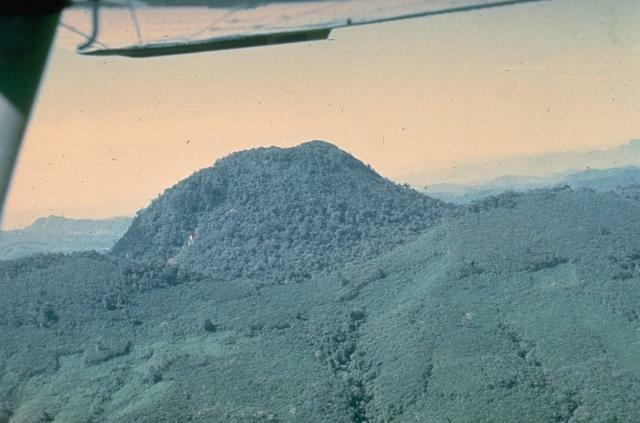 The pre-1982 summit of El Chichón volcano is seen in this aerial view from the east. A large lava dome that formed the previous summit of the volcano fills a 1.6 x 2 km wide central crater that was created about 220,000 years ago. This dome was destroyed by the 1982 eruptions, which created a new 1-km-wide crater centered on the former dome. The two forested peaks outside the older crater are the SW (upper left) and NW (upper right) lava domes. Photo by René Canul, 1981 (Comisión Federal de Electricidad). Prior to the major 1982 eruption, El Chichón volcano, viewed here from the SW in 1981, contained a large summit lava dome (upper right) and a lower flank dome (center) inside two overlapping craters. A white steam plume rises from a fumarole along a fault cutting the left side of the larger dome. The last major eruption of El Chichón prior to 1982 occurred about 500 years ago, but residents reported an eruption about 130 years ago, witnessed by their grandparents, that was strong enough to prompt an evacuation. A deposit of ash blankets the countryside around El Chichón volcano, seen in the background, on April 19, 1982, about two weeks after a series of major eruptions. Ash covered an area of more than 45,000 sq km in a ENE-trending lobe. At this location, 12 km NE of El Chichón, the ashfall deposit was 30 cm thick. Fine ash and sulfuric-acid droplets from the 1982 explosive eruptions of El Chichón circled the globe and were responsible for brilliant sunsets in the northern hemisphere for the next few years. Steam pours from the new crater of El Chichón volcano in June 1982, about two months after the formation of the crater during a major explosive eruption. When the crater was first seen after the eruption on April 25, three small lakes were observed on the crater floor. These merged into a single lake that reached a maximum depth of about 120 m. This aerial view from the east also shows erosional gullying of pyroclastic-flow and -surge deposits in the foreground on the outer flanks of the crater. Photo by Wendell Duffield, 1982 (U.S. Geological Survey). 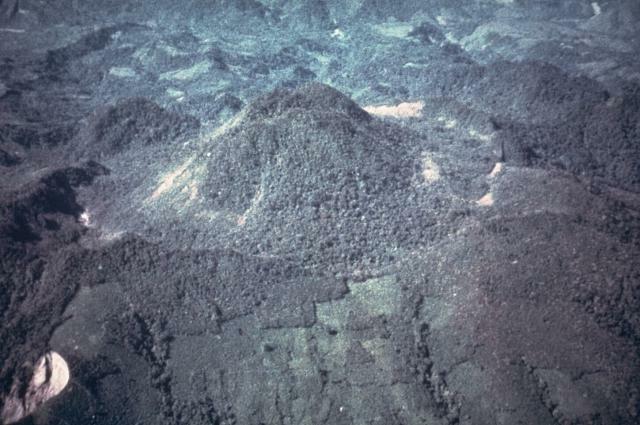 A high-altitude aerial oblique view taken on November 4, 1982 shows the effect of the El Chichón eruption about seven months later. This view from the west shows fumaroles around the new lake partially filling the crater and areas devastated by pyroclastic flows and surges. 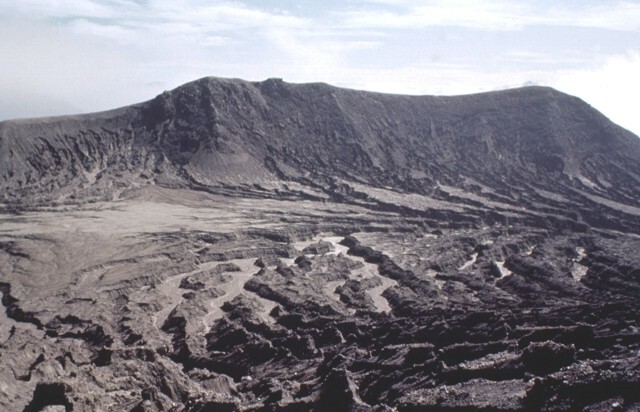 The circular rim of the nearly 2-km-wide pre-eruption somma can be seen surrounding the 1982 crater rim. Photo by National Aeronautics and Space Administration (NASA), 1982. 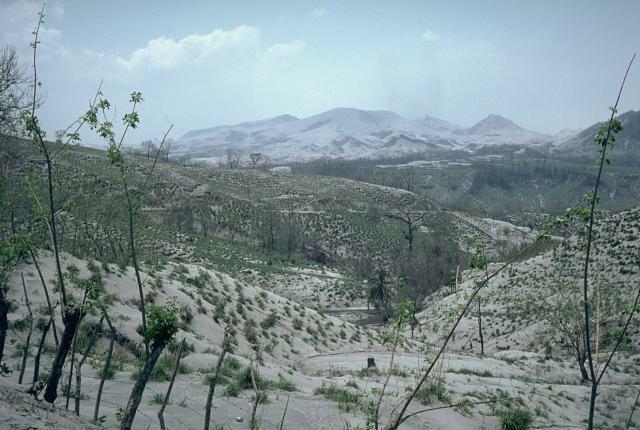 Devastating pyroclastic flows and surges from the March-April 1982 eruptions turned large areas surrounding the crater into a moonscape devoid of vegetation. The pyroclastic flows and surges swept radially away from the volcano to distances of about 6 km, devastating an area of about 150 sq km. This January 1983 aerial photo shows the effect of extensive erosional dissection of these deposits during the previous rainy season. Billowing white steam plumes pour from fumaroles on the crater floor of El Chichón volcano in January 1983. Small puffs of steam also rise from the hot, acidic crater lake in the foreground. 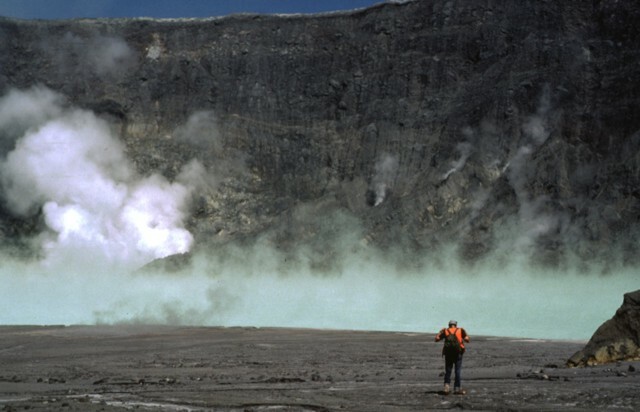 Temperatures of fumaroles on the crater floor and lower crater walls at this time ranged from 98 to 115° C.
The steaming crater of El Chichón volcano is seen here in January 1983, less than a year after a major explosive eruption formed a new 1-km-wide crater that later was partially filled by a steaming, acidic lake. The isolated El Chichón volcano is a small, but powerful andesitic tuff cone and lava dome complex. Prior to 1982, this relatively unknown volcano was heavily forested and of no greater height than adjacent non-volcanic peaks. More than a half dozen large explosive eruptions have occurred since the mid-Holocene. The east rim of the 1982 crater at El Chichón is seen here from the rim of the larger somma crater. Erosional gulleys dissect pyroclastic-flow and -surge deposits that swept radially away from the 1982 crater. The rim here rises about 50 m above the moat between the two craters. Prior to the 1982 eruption a lava dome rose several hundred meters above the crater floor. A volcanologist traverses the floor of the El Chichón crater toward the steaming, turquoise-colored crater lake in January 1983, during the first visit to the crater following the major March-April 1982 explosive eruption. The new lake had grown by November 1982 to a depth of about 120 m, after which lake level dropped slightly. In January 1983 the lake was hot (52-58° C) and acidic (pH of 0.5). By October 1983 the temperature had dropped to 42° C and the pH was 1.8. Pyroclastic surges completely devastated vegetation on the flanks of El Chichón volcano to distances up to 8 km from the crater. Still-steaming pyroclastic-flow and -surge deposits are seen in this early April photo at Francisco León, 5 km SSW of the crater. Three major pyroclastic flows swept the flanks of the volcano on April 3 and 4, devasting an area of 154 sq km; all three surges reached Francisco León. Pyroclastic surges swept over ridges as high as 300 m and left sharp trimlines at their margins. Photo by Servando De la Cruz-Reyna, 1982 (Universidad Nacional Autónoma de México). Ashfall deposits, such as seen here near Villahermosa north of the volcano, whitened the landscape around El Chichón like snow and stripped many trees of their leaves. Ashfall deposits trending to the ENE blanketed an area of 45,000 sq km within the 1 mm isopach. Eruption columns on March 28-29 and April 3-4 reached 17 km or higher. The exceptionally high sulfur content of the El Chichón magma produced an eruptive plume rich in sulfuric acid aerosols, which circled the globe in three weeks and led to warming of the stratosphere. Major pyroclastic-flow deposits of the April 3 and 4 El Chichón eruptions formed natural dams blocking the Magdalena-Ostuacán river. The tephra dam seen here, located about 4.5 km WSW of the crater, produced a lake that eventually reached 5 km in length and had a volume of several million cubic meters. It failed catastrophically about 7 weeks after the end of the eruption (May 26), causing a massive lahar with temperatures to 82° C that destroyed a bridge and damaged a hydroelectric site, killing one worker. 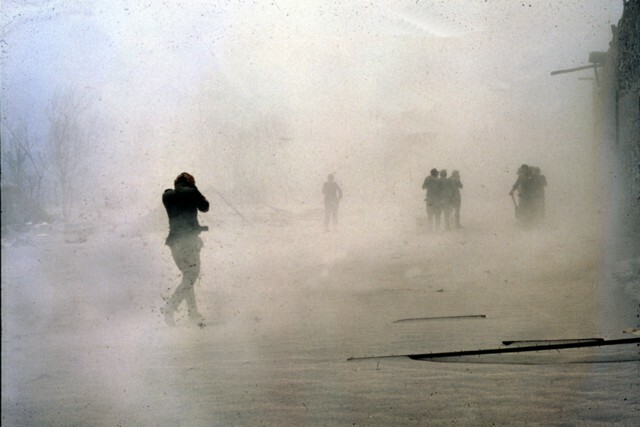 Windblown ash obscures soldiers searching the town of El Naranjo, 7.5 km south of the crater, a few days after the end of the eruption. Among the several thousand deaths caused by the eruption were one geologist and 32 soldiers sent to the village of Francisco León, ~ 6 km SW of the summit, after the March 28-29 explosion. The pyroclastic flow that traveled through Francisco León left only a thin deposit, but of the structures in the village, only one wall of the church, parallel to the direction of the pyroclastic flow's movement, remained standing. 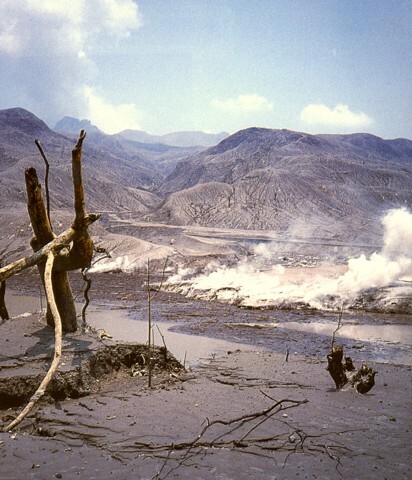 The terminus of a pyroclastic-flow lobe about 4 km NE of the crater, south of Nicapa, is seen within a day or two of its emplacement on April 4, 1982. The Nicapa valley was the site of the most extensive pyroclastic flows of the 1982 eruption. Up to three units, each 2-15 m thick and containing abundant pumice blocks 15-40 cm in diameter, are present. Light-colored ash from the April 4 pyroclastic surges covers a broad radial area around the crater to distances 1.5 km beyond the extent of the pyroclastic flows in the Nicapa valley. 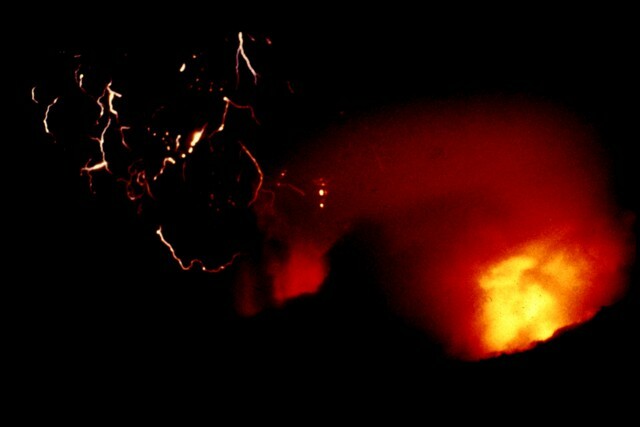 An incandescent pyroclastic flow (lower right) travels down the flanks of the volcano as lightning bolts accompany an eruption plume (center) from El Chichón on April 3, 1982. Minutes later this eruption column reached a height of about 24 km. The ejection of large amounts of incandescent tephra and pryoclastic flows and surges caused extensive damage and fatalities. Explosive removal of the summit lava dome created a new 1-km-wide, 300-m-deep crater. The following 110 samples associated with this volcano can be found in the Smithsonian's NMNH Department of Mineral Sciences collections, and may be availble for research (contact the Rock and Ore Collections Manager). Catalog number links will open a window with more information. Large Eruptions of El Chichón Information about large Quaternary eruptions (VEI >= 4) is cataloged in the Large Magnitude Explosive Volcanic Eruptions (LaMEVE) database of the Volcano Global Risk Identification and Analysis Project (VOGRIPA).